Despite increasing competition in the electric car industry, our outlook for Tesla stock in 2017 is still bullish. In fact, Money Morning Options Trading Specialist Tom Gentile believes that Tesla Motors Inc. (Nasdaq: TSLA) stock could hit $300 a share. Competitor Faraday Future unveiled the upcoming FF91, its electric car, at the Consumer Electronics Show from Jan. 5 to Jan. 8. The reveal generated over 64,000 pre-orders at the weekend-long show. While Faraday Future may be creating a lot of interest now, Tesla has something Faraday can't compete with: size. Tesla is the only publicly traded electric car company in the world. With a market cap of almost $40 billion, Tesla is within 20% of the size of Ford Motor Co. (NYSE: F). Plus, Faraday Future is less than half the size of Tesla. In November 2015, Faraday had 5,000 employees, while Tesla had 12,000 employees. Don't Miss: This is one of the best buying opportunities of 2017. Competition is usually looked at as a negative, but in Tesla's case the competition can only help. The attention helps generate consumer interest in electric cars. That will boost Tesla's revenue, and eventually Tesla stock, too. Size is just one competitive edge that Tesla has over Faraday. Tesla has diversified into residential solar power. This diversification will help the company weather the bumps along the road to electric cars becoming mainstream. With the purchase of SolarCity Corp. (Nasdaq: SCTY) in November, Tesla has effectively taken control of every aspect of solar energy systems from development and construction to the sale and distribution of the systems. Through the first two weeks of 2017, Tesla stock is down from its 52-week high of almost $270. It has been trading in a range of $180 to $240. This range has formed a support of $180 and a resistance of $240. Shares opened today (Tuesday) at $236.70. A quick note on Support and Resistance: Support is the lower level of a range a stock is trading at. As the price drops down to the support line, more investors are interested in the stock. The buying interest helps drive the stock back up in price. At the resistance line, a large number of investors are willing to sell the stock to cash out. This surplus of sellers helps to bring the price back down. 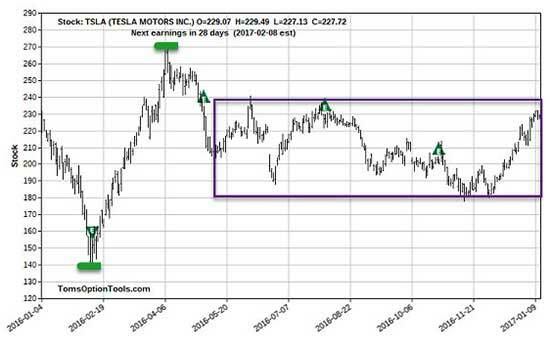 With the increased interest in Tesla, the stock price is pushing up against resistance and ready to break out to new heights. Now is an attractive time to purchase Tesla. However, at $236.70 a share, it can be cost prohibitive. In order to buy 100 shares, you would have to invest $23,670.00. If you buy Tesla stock now and the stock hits $300, you'll make $6,330, or 26%. Gentile recommends playing Tesla stock with options, and specifically LEAPS. "So one profit opportunity you could consider as a trader is long-term anticipation securities (LEAPS)," Gentile said on Jan. 9. "You could also go a step further and consider a LEAP bull call spread or a LEAP butterfly call spread to be more cost effective while still participating in any upward price movement of the stock. Just be sure to work with your financial professional to see if any of these strategies would be right for your portfolio." LEAPS allow you to ride the uptrend for a fraction of the cost. Current call LEAPS expiring in January 2018 for Tesla are trading at $30 (a $3,000 investment since you control 100 shares) with a strike price of $250. The initial investment of LEAPS is 87% less than the investment of buying 100 shares of Tesla stock, making it much more affordable. The Bottom Line: Tesla stock is set to rise in 2017. It has the competitive advantage of size and being the first mover over Faraday Future. Not to mention Tesla has diversified into solar energy to help it weather the potentially bumpy road to electric cars going mainstream. Even if the price of the Tesla stock is cost prohibitive, you can ride the uptrend by purchasing options contracts. These contracts allow you to ride the upward motion of a stock for a smaller investment and a larger percent return. Up Next: Options guru Tom Gentile shows you how to make 100% or more in "How to Make a (Stress-Free) Killing with Options."